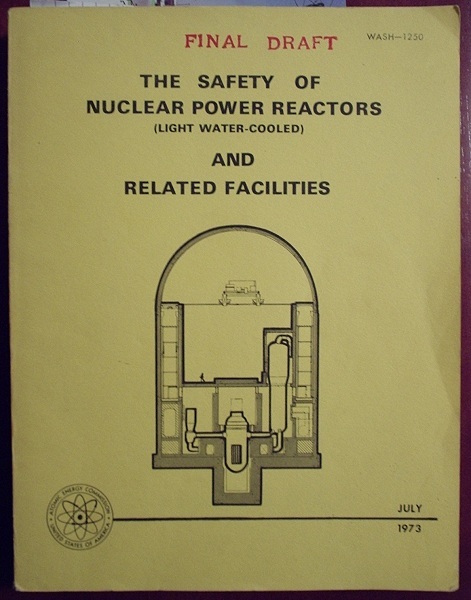 WASH-1250, properly known by title as "The Safety of Nuclear Power Reactors (Light Water-Cooled) and Related Facilities," published on a very limited basis as a final draft by the Atomic Energy Commission in July 1973 is in many ways a remarkable document, coming between WASH-740 (the first large scale reactor safety and accident consequence study from the late 1950's) and WASH-1400 (the well known Reactor Safety Study, which incorporated PRA or Probabilistic Risk Analysis and fault tree methodology to predict risk.) WASH-1250 did not live up to the hopes of its authors in decisively communicating risk (Source: A. David Rossin, and others) and has thus never seen the light of day to any extent. Contained in this volume is a brief but fascinating treatise on the development of public sentiment toward nuclear energy in the United States from inception up to the time of publication of this final draft in 1973. A number of American Nuclear Society members (and others) have requested this information, included in the report as "Appendix III - Public Attitudes" for use in developing the realistic history of some of the anti-nuclear sentiment, and some of the real concern, in this country from the AEC (and thus essentially the nuclear industry's) point of view. APR is now proud to reproduce this important work below. Any discussion of public attitudes toward nuclear power must proceed from an imprecise base since it is difficult to first define what "public" we are talking about. Is it conservation and environmental organizations? Intervenors in contested licensing hearings? Authors of books and letters-to-the-editor? Persons living near nuclear plants? Little nationwide sampling of public opinion has been done on the subject of nuclear power. Utilities have commissioned private polls which generally show that a great many persons in their service areas do not oppose nuclear plants. On the other hand, the number of contested licensing hearings is increasing. These hearings, which used to be sparsely attended, if at all, now draw large attendance and news media interest is at an all-time high. Public awakening to the environmental issues which confront our society coincided with the initial period of rapid growth of nuclear power. Land usage, energy growth, the economy, and distrust of government, science and industry are other issues which have come to the forefront during this period and, as one scientist has put it, "nuclear power has by historical accident become the arena in which these questions are being discussed." 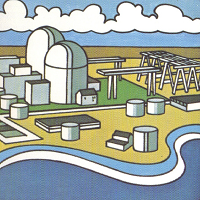 Although the nuclear power program in the United States has developed with unprecedented public scrutiny, there is ample evidence that many members of the public still have concerns about the safety aspects of nuclear power generation, ranging from the release of small amounts of radioactive material to the environment during normal operation, to the possibility of serious accidents which could harm the public, and to the handling of the highly radioactive wastes which result from chemical reprocessing of the used fuel. Other concerns are expressed about the effects of discharging condenser cooling water into nearby rivers, lakes, or oceans; about the transportation of spent fuel from the power plant to the reprocessing site; and about the disposal of radioactive waste materials. Basic to an understanding of the controversies which have surrounded some nuclear plants is the realization that from the inception of the nuclear power program, the Commission (the AEC) has been concerned with safety. For many years that was practically the only issue considered at the public hearings held in local communities on individual plants. Many persons within the nuclear industry have commented that the AEC talked about safety so much and is supporting so much safety-related work that it is not surprising that the average citizen may have some apprehensions. The jargon of the nuclear industry has not offered much comfort. Terms such as "design basis accident," "maximum credible accident" and "reasonable assurance" may be perfectly acceptable to the scientist and engineer, but are not reassuring to the public. On the other hand, some persons who willingly accept everyday risks such as highway traffic, walking across streets, using electricity and fire, often use another yardstick with respect to nuclear power, insisting on absolutes which will never be attainable. Public attitudes about nuclear power have gone through a number of phases, ranging from little interest to very high interest - the situation that prevails today. Early nuclear power plants, such as the Shippingport facility (Duquesne Light Company), Dresden Unit 1 (Commonwealth Edison Company of Chicago), and Yankee Rowe (Rowe, Mass. ), experienced little public apprehension. The Enrico Fermi breeder reactor (Monroe, Michigan) ran into opposition in a case which challenged the Commission's (AEC's) licensing regulations -- a matter finally decided by the U.S. Supreme Court. It is interesting to note that the strongly worded dissent by two justices in this case has received more attention than the majority opinion, and even today is used by some opponents of nuclear power. It was during this early period of nuclear power that the first fatal accident in the history of U.S. reactor operations occurred in the SL-1 -- a small military reactor -- at the AEC's National Reactor Testing Station in Idaho. Organized resistance to nuclear power plants first emerged in the period beginning about 1962. Although regionalized in the New York City and California areas, it was the first serious challenge to the safety of nuclear power. The controversies surrounded the application of Consolidated Edison Company to build a 1000 megawatt nuclear plant at its Ravenswood station in New York City; and application for two proposed plants in California, the Bodega Bay plant of Pacific Gas and Electric Company and the Malibu plant of Department of Water and Power of the City of Los Angeles. 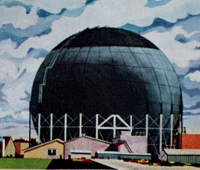 The opposition to Ravenswood included a former Chairman of the Atomic Energy Commission, David Lilienthal, who was quoted as saying he would not dream of living in Queens if the Ravenswood plant was built. Mr. Lilienthal also raised questions about the handling of high-level radioactive wastes. Groups such as "CANPOP" --Committee Against Nuclear Power Plants -- were formed and persons attending public meetings were greeted with literature headlined "No Hiroshima in New York." The Ravenswood application presented the Commission with a major policy issue -- whether to permit the construction of nuclear power plants in large cities. This case never completed the AEC regulatory process, since Consolidated Edison withdrew its application for a construction permit. While all this was going on in New York City, another controversial case was taking shape on the West Coast. That invoved the application of Pacific Gas and Electric Company for a permit to build a nuclear plant at Bodega Head, about 50 miles north of San Francisco. Opponents to this plan began with a plea to preserve this ocean site for parkland, but when this argument failed at the local level they turned to the AEC and the issue of earthquakes and reactor safety. 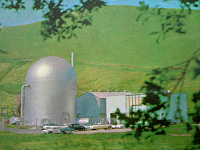 The Bodega Head plant was never built because the AEC Regulatory Staff reported it could not make the required safety findings for the facility at that site, and the utility withdrew its application. Also in California, the application of the Department of Water and Power of the City of Los Angeles to build a nuclear plant near Malibu Beach ran into strong opposition. Here too the initial controversy involved industrial encroachment of the area, although intervenors ultimately raised the earthquake safety issues in AEC hearings. The Malibu plant wasn't built either. After lengthy public hearings, the Commission decided it didn't have enough information to support approval of the plant at that site. Despite these scattered controversies, the public's opinion of nuclear power seemed receptive during this period. For example, the San Onofre nuclear plant (located between Los Angeles and San Diego) and the Nine Mile Point nuclear plant (New York State) did not encounter serious opposition. Subsequently, there were other favorable examples, enough to that possibly the nuclear industry was lulled into believing that its public information efforts had been enough, and that the new industry could now undergo a rapid expansion without facing serious public reaction on each proposed facility. If a period of complacence existed, it was short-lived. In 1969 the AEC and the nuclear industry found themselves in the midst of a nationwide controversy concerning the environmental aspects of nuclear power, pricipally radiation effects from the low levels of liquid and gaseous radioactive effluents released during normal operation, and the thermal effects on lakes, rivers and oceans of the discharge of condenser cooling water. For some years, the AEC had taken the position that it should not debate the opponents of nuclear power. It believed that its proper role was to provide the facts (technology) and to do a conscientious job of regulating nuclear plants. The reason behind this view was that the Commission did not want to undermine the integrity of its regulatory process by engaging in debates, which, while cast as an overall discussion of nuclear power, could be interpreted as an endorsement of a particular plant. But the period of greatest growth of nuclear power came at a time when the environmental conscience of many Americans was becoming troubled. As the Washington Post noted, "In many ways atomic power is growing at a difficult time. The public, sensitive about dangerous pollution from its present power plants, is becoming aware that atomic plants may have dangerous pollution of their own." During the period beginning in early 1969 a large number of books and articles began to appear on news stands and bookshelves; most challenged the atom on environmental grounds, although safety was also an issue. The partial meltdown of fuel at the Enrico Fermi plant in 1966 was often cited, thereafter, sometimes in the vein that the City of Detroit narrowly escaped a catastrophe, and always raising the question "But what if...?" Accidents unrelated to the nuclear power program, such as the costly May 11, 1969 fire at the AEC's weapons plant at Rocky Flats, Colorado, were also cited as evidence of the lack of care being exercised by the AEC for assuring the protection of public health and safety. The State of Minnesota adopted standards for limiting the releases of radioactive materials which were far more stringent than concurrent Federal standards, setting off a debate which involved States' rights, the conservatism of existing standards and the question of whether the Atomic Energy Act of 1954 pre-empted to the Federal Government the authority to regulate effluents from nuclear power plants. That issue was not finally decided until 1972 when the U.S. Supreme Court affirmed a decision of the U.S. Court of Appeals for the Eighth Circuit which held that the Congress had given the Federal Government sole authority over radiation safety matters. The subject of radiation standards was widely debated during this period. Charges included increased infant mortality in areas near nuclear plants -- charges promptly refuted by State Health Departments and other authorities -- and widely disputed estimates concerning the number of cancer deaths which would result from exposure of the whole U.S. population to 170 millirem per year -- the recommended upper limit for large groups of people from sources of radiation other than background radiation and medical uses. Responsible scientists pointed out that it would be virtually impossible for the general public to receive such an exposure from routine nuclear plant effluents, but these supportable statements did not receive the attention given to the more frightening allegations which evoked the response. The AEC's position with respect to thermal effects -- that it did not have jurisdiction since this was a matter common to all thermal power plants -- also drew sharp criticism in many quarters from persons who felt the AEC was ignoring an important environmental matter. Early in 1969 there was a shift in thinking at the AEC. The Commission decided that it no longer could view the nuclear controversy from afar. There was, the AEC decided, a need to counter the frightening material being distributed. This decision led to a period of confrontation with the accusers of nuclear power, beginning at a school auditorium in New Jersey and stretching from there to New Hampshire, Vermont, New York, Michigan, Oregon and elsewhere. The AEC continued to refuse to debate specific projects -- that was and still is the individual utility's responsibility. But Commission representatives did discuss overall safety precautions, the basis for radiation standards, thermal effects, and the need for nuclear power in the total U.S. energy picture. The conference on "Nuclear Power and the Environment" in Burlington, Vermont, in September of 1969 brought out the deep concerns being expressed by some members of the public. Arranged under the auspices of Senator George Aiken and Governor Deane Davis, the conference brought together three members of the Atomic Energy Commission and key persons on its staff, and a number of the critics of nuclear power. The critics repeatedly emphasized two areas of concern, i.e., the effects of low levels of radiation and thermal effects on the biosphere. Similar interests were reflected in questions from members of the public. One observer calculated that of 130 questions form the audience during an afternoon question-and-answer session, 42 were on the subject of radiation effects and standards; 24 dealt with thermal effects, and 17 were concerned with the organization and procedures of the AEC. Such issues as fuel supply, energy demand, plutonium, the breeder, and economics drew only a few questions each. The proceedings of the Vermont meeting were published by the AEC, and they provide a valuable insight into the dimensions of the controversy as it existed in late 1969. In their self-analysis of the Vermont meeting, AEC participants generally agreed that their presentations tended to be too technical, their answers a bit too scholarly for a lay audience. In striving for precise answers to questions, the impression often left was that the AEC was beating around the bush. The Vermont meeting was followed by a conference sponsored in Minneapolis by the University of Minnesota. It brought together representatives of the Congress, the AEC, the Environmental Protection Agency, the nuclear industry and nuclear critics. Most observers agreed that the AEC had profited by its mistakes in Vermont and its answers to the questions of concerned Minnesotans were more straight-forward and understandable. Public hearings in late 1969 and early 1970 before the Congressional Joint Committee on Atomic Energy concerning the "Environmental Effects of Producing Electric Power" amassed information on all aspects of the subject. The Committee heard from Government, industry and from scientists and engineers representing a wide spectrum of disciplines. The record of these hearings may well be the most comprehensive source document available on electricity and the environment. By early 1970 it became clear that the ocntroversy over nuclear power and the environment was not abating; if anything, it was intensifying. On April 22, the first "Earth Day" programs on the environment were aired across the nation. Although nuclear energy wasn't singled out in many of these programs, the AEC cooperated by providing speakers for many of the observances. Earth Day was a turning point, according to one news reporter. "It was a turning point not because this day produced any new evidence, but because it suddenly changed the environmentalist cause from something that was confined to the cranks and fringe groups to something that was completely respectable," he observed. The National Environmental Policy Act (NEPA), an historic piece of legislation, became law on January 1, 1970, but how profound an effect it would have on the AEC licensing program did not become evident until months later. The AEC published its first policy statement implementing NEPA on April 2, 1970, and a revised policy statement on December 4. In its policy statement, the AEC noted that the Water Quality Improvement Act of 1970 required an applicant for an AEC facility license to provide, before the license is issued, a certification from the appropriate State or Federal agency that applicable water quality standards would be met. The AEC would thus accept this certification with respect to these efforts. The AEC's implementation of NEPA was contested in Federal Court in a proceeding involving the Calvert Cliffs nuclear power plant in Maryland. The Circuit Court of Appeals for District of Columbia Circuit issued a decision in the Calvert Cliffs case on July 23, 1971, directing changes in the AEC's implementation of NEPA. The court charged that the AEC had "made a mockery" of NEPA. On August 27, the Commission's new Chairman, James R. Schlesinger, issued a statement asserting that the Commission would not appeal the Court decision, and would issue revised regulations to implement that decision. "The effect of our revised regulations will be to make the Atomic Energy Commission directly responsible for evaluating the total environmental impact, including thermal effects, of nuclear power plants, and for assessing this impact in terms of available alternatives and the need for electric power. "We intend to be in a position to be responsive to the concerns of conservation and environmental groups as well as other members of the public. At the same time, we are also examining steps that can be taken to reconcile a proper regard for the environment with the necessity for meeting the nation's growing requirements for electric power on a timely basis." The AEC published its new regulations on September 3, 1971, and they were generally regarded by environmental groups as being fully responsive to the Court of Appeals decision. Actions in 1970 and 1971by the Commission with respect to the low-level radioactive effluents which may be discharged from nuclear power plants also served to quiet the debate over radiation effects. 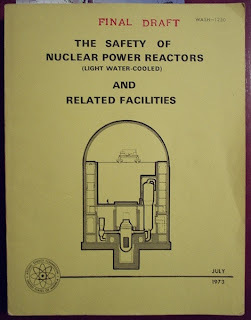 On December 3, 1970, the Commission announced steps to implement its policy of keeping releases from light water cooled nuclear power plants to levels which are as low as practicable. This formal implementation of the low as practicable guidance recommended by national and international radiation protection organizations provided qualitative guidance for determining when design objectives and limiting conditions for operation meet the requirements for keeping levels of radioactivity in effluents as low as practicable. The AEC noted that exposures of the public living in the immediate vicinity of operating power reactors have usually been small fractions of the existing radiation protection guides and that it was taking this step toward further reductions to help assure that exposures of the public would continue to be kept very low as the number of nuclear plants continued to grow. In June of 1971, the AEC followed up on this action by proposing numerical guidelines which would limit radioactivity in effluents to levels that would keep resultant radiation exposures of persons living near the nuclear plants to less than five percent of the average natural background radiation. Such exposures would be about one percent or less of the Federal radiation protection guides for individual members of the public. This numerical guidance to implement the low as practicable concept was the subject of a public rulemaking hearing during 1972 in which general agreement was expressed with the AEC proposal. The Commission also took steps to make clear to the nuclear industry and to the public what its role is, and what it is not. "There is a heightened public sensitivity on environmental issues -- an insistence by the public that it be consulted. We shall all have to learn to operate under these changed conditions. You will not only have to operate in the glare of publicity, you will have to take your case to the public. Do not expect us to do this for you..."
The environmental movement has moderated its tone over the last year or so, and so has the AEC. Efforts were initiated by the Commission to discuss concerns with leaders of environmental and conservation groups, and these exchanges have been productive for all involved. There are indications that while the AEC -- and the nuclear industry, as well -- are taking stock of their positions, so too were environmental and conservation organizations. "Now let me lead you further down the proverbial, but jaundiced, primrose path. One wonders today who is who among conservationist and conservation groups. Self-styled ecologists, conservationists, and environmentalists are coming out of the woodwork everywhere. A big headline of the January 7, 1972 Washington Post read: 'Conservationists ask Court to split AEC.' A reading of the article to see which of my sister organizations were involved revealed none of them. All those involved were local or regional groups from portions of a few eastern states such as Long Island's Lloyd Harbor Study Group. The article revealed the plaintiffs had not even analyzed the steps to be taken if their suit for dividing the AEC were successful. Much of this type of action may not be so much an expression of concern for the environment as it may be an expedient and productive endeavor for today's crop of young attorneys..."
Although the tone of the controversy has moderated, in most quarters, issues remain, and the debates over them continue. 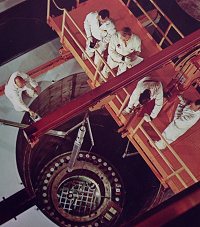 Although it is difficult to categorize the continuing issues, it can generally be said that they involve reactor safety and related matters such as the transportation of nuclear materials,, the storage of high-level radioactive wastes, the development of the breeder reactor and widespread use of plutonium fuel, safeguarding fissionable materials from diversion and the dual role of the Atomic Energy Commission which is both developer and regulator of nuclear power. Reactor safety appears to have been an on-again, off-again issue in the eyes of many members of the public. During the period when the Ravenswood, Bodega Head, and Malibu applications were before the AEC in the early 1960's it was a hotly-debated matter; then it receded into the background as radiation standards and thermal effects became prominent issues. Now reactor safety has come to the forefront again, although from the standpoint of the AEC it has always been a paramount concern in the licensing of nuclear plants. Part of the reason for the re-emergence of reactor safety as an issue probably lies in a growing distrust of technology. In large part, it also involves the AEC's on-going rulemaking proceeding concerning acceptance criteria for emergency core cooling systems for nuclear power plants. The AEC's public hearing, an innovative proceeding which has attracted nation-wide attention from the news media, has allowed persons representing all viewpoints to express their position on this highly complex subject. It is difficult for the average citizen to understand the complexities of emergency core cooling systems. It is equally difficult for him to judge who is right when scientists differ on such a subject. Also involved in the safety issues are: The long-term storage of high-level radioactive wastes, the opposition to storing them in a salt repository near Lyons, Kansas (despite the fact that the local populace generally was in favor of the proposed project); transportation of high-level waste and used fuel from reactors, as well as plutonium, in increasing quantities; and the development of the fast breeder reactor. The high-level waste controversy appears to have eased somewhat as a result of the AEC's announcement that it plans to design and build engineered surface storage facilities which will be capable of handling the wastes for as long as is required to develop additional information which can prove the safety and feasibility of permanent storage in a selected geologic formation. The public wants more information on the subject of the transportation of nuclear materials such as radioactive wastes, increasing amounts of spent fuel, and plutonium, as the industry grows. This is an area where the Commission expects to concentrate more attention in its public information program. Additional information efforts are also required on the development of the fast breeder reactor. This program has the strong support of the Administration and the Congress, and it is the top priority effort of the AEC in the reactor development area. A solid information base must be presented to the public, both in the Tennessee area where the first developmental plant will be built, and nationwide. Thus far, the public's attitude on the breeder reactor appears to be one of "tell me more." The public is entitled to the facts, and the Commission is committed to providing them. The environmental statement already issued by the AEC on the liquid metal breeder demonstration plant offers a wealth of information to the public, and widespread distribution of it has been made. At the outset we noted that public attitudes are hard to assess. They may differ from one section of the country to another; the concerns are not always the same. But all concerns must be met with responsiveness on the part of the Commission. The attitude of the public toward nuclear power can be strongly affected by the willingness of both the AEC and the nuclear industry to talk frankly about goals, accomplishments, and, of more importance, problems. 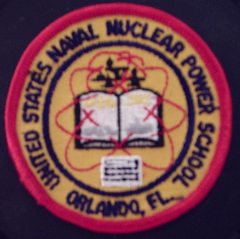 "I am teaching my class ALL ABOUT nuclear energy. Please send me a picture of an atomic bomb- and some mushroom clouds if you have them." This concludes the content of APPENDIX III of AEC report WASH-1250. It is this author's firm opinion that this text overall is important enough that everyone in the nuclear industry should read it- especially those involved with public communication. The observations contained therein are as relevant today as then; all that must be done is to convert them into today's context.